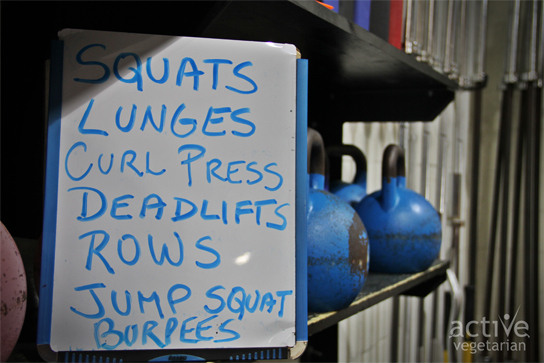 This one is a little different than usual, we are including weights and it is based on complex training. Complex training is a great way to add some variety to your workouts, you can always change the exercises, structure of the reps (pyramid/reverse pyramid), or instead lift for time. Remember: you want to always keep the intensity high, and limit rests between exercises. Complexes are meant to be a cardio-based workout. Alright so are you ready? If you want to make it even more fun…. time yourself! and let us know how you did. Stay fit and stay healthy! I met you at Ron Zalko gym lat night and you let me know about your site. THANK YOU!! I am totally stoked to try out your routines, starting with the Cruel Complex! What total time should I strive for to complete the 5 rounds? I see it mentions 30 -45 mins so hopefully work my way to eventually being able to complete it in 30mins? P.S. I’ve already passed on the site to a few friends who I know will get good use out of it. I would aim for 30-45 mins, time yourself and then try to beat your time down the road. I also find that when there’s a timer running you tend to push yourself a little harder, well at least I do! The key is to rest as little as possible between exercises. It is okay to rest between rounds though, I would keep that rest period to a maximum of 60 secs. – Complex training is supposed to be more cardio based. Enjoy and let us know how you do!